time or the expertise to build a good quality Homebuilt. During the winter of 2015-16 while riding with a friend we decided it was time to look at building a Ski Bike…there may have been a few beers consumed as this thought crossed our minds…because this was one of those projects that was way way easier said than done! We sketched some ideas onto a napkin…OK cocktail napkin…and set our goal…”Design and fabricate a quality full-suspension Ski Bike, that can be ridden all-mountain and can be sold for under a $1000.” Again, way easier to write this on a napkin, than to accomplish it! Our first step was to build some prototypes…and go thru the awesome trial and error process…you know that process…”Well it looked good in my mind…unfortunately it didn’t translate to the slopes.” So we kept designing and re-designing with the same singular goal in mind…Build a Ski Bike that can perform at an all-mountain level, and most importantly bring it to market for under $1000. This proved to be incredibly challenging…as every item on the this new Ski Bike had to fit into a budgeted line item and not sacrifice the quality and all-mountain ride of our Ski Bike. 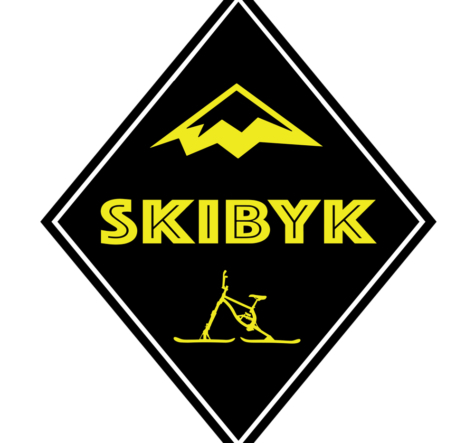 So that brings us to the 2016-17 season…we had all of the I’s dotted (costs) and T’s crossed (there were a ton of these) we manufactured 6 SkiByk’s…oh yeah we came up with a name as well…SKIBYK, LLC…the attorney’s made us make it official…and started to ride the hell out of them. We put everyone we could find on the new SkiBykes…old, young, big, small, beginner, expert, we even had a guy borrow our SkiByk at a contest in Oregon and take first place in the Pegger/Freestyle class…after only one run! We asked for feedback throughout the season…the responses we received were great…”nimble’, “very responsive”, “wow”, “pretty freak’ncool dude” and we got a lot of “where do I get one?” and we did have one 65 year old ski patroller who made it down from the top to the bottom and said “cool, thanks but not for me” We were good with that as we just thought he was pretty cool for trying it and watching a Ski Patroller ride our SkiByk was awesome as well! So all of this testing, prototyping, designing, re-designingnow brings us to the upcoming season and here is where we are at…we worked very closely with a manufacturer of SkiBoards to develop and build quality SkiByk ski’s…those arrived last week…and they look awesome. We had prototypes of these Ski’s last season and they were a blast…fantastic all-mountain performer! As the SkiByk is primarily designed for the newer SkiByker…which most everyone is…we went with a wider tip and tail and a narrower waist (the specific specs of the Ski Byke and Ski’s can be found under the PRODUCT box). This configuration will allow the SkiByker to have more control over the SkiByk and transition quicker edge-to-edge, but still give you the floatability you are looking for in softer snow conditions! We are headed overseas again to sign off on our first production run and make sure everything has been manufactured to our engineering designs and specs. Once that is done we will be taking orders this month for a November delivery and you now have another option in the world of Ski Bikes.